The Nene Valley area is literally covered with Roman forts and occupation following the main arterial road Ermine Street. Perhaps the most well known site is just to the north of Peterborough close by Water Newton just off the current A1. The Roman Town of Durobrivae and the Roman fort adjacent to the town protecting the crossing of the river Nene. 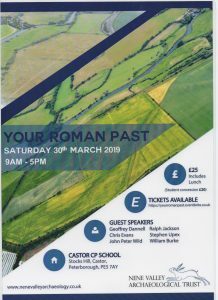 Come along to this exciting day of exploration of our Roman history and listen to the guest speakers, Geoffrey Dannell, Chris Evans, John Peter Wild, Ralph Jackson, Stephen Upex and William Burke, talk about the influence of Roman occupation in the Nene Valley. This entry was posted on February 1, 2019 by David.